Get the latest Australian BSB10115 Certificate I in Business training resources and assessment tools from one of Australia’s leading training resource developers! Get the Assessment Tools Only package for the BSB10115 Certificate I in Business qualification! Compliant Learning Resources will provide you with Certificate I Business Assessment Tools so you have the RTO training materials to assess this qualification. You can develop your own learning content to match, or utilise a third party learner resource of your choice. You will receive an unlimited student license, meaning you can deliver and assess training to as many students as you want using this training resource. We also give you crucial mapping documents! All assessments are mapped directly against the relevant unit of competency and verified to ensure every competency requirement has been assessed using appropriate methods of evidence collection. Unit by unit BSB10115 Certificate I in Business RTO Assessment Tools! This BSB10115 Certificate I in Business Assessment Tools Package has been developed in a unit by unit format so you can select from a range of elective units to design your ideal qualification packaging, or order extra elective units so you can offer a selection of specialized course outcomes to your students. In our experience, this flexibility is ideal for BSB package qualifications so you can tailor training outcomes to specific industry and business needs. Our unlimited student license model means you purchase the training resource once and deliver and assess training for as many students as you want with no additional fees! This is an Assessment Tools only package, meaning you will receive the materials to assess the qualification, and will need to supply your own learner resources, textbooks or other materials to deliver the course content to your students. This BSB10115 Certificate I in Business training and assessment package is supported by a Simulated Business intranet site so you can provide your students with simulated assessment pathways. This allows your RTO to deliver training to students who are not in the workplace, and international students who are not able to work in Australia. Your students will log into the Simulated Workplace and access simulated business resources they require to complete assessment tasks. Access to the Simulated Workplace resources is included in your license fee, with one login per student provided. Each login is valid for 12 months from the first log on. 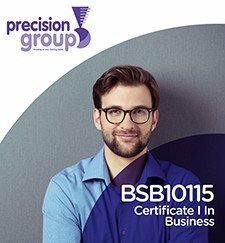 This is BSB10115 Certificate I in Business Assessment Resource Kit is written and maintained by Precision Group Pty Ltd, and sold under an agreement by Compliant Learning Resources. Licensing and support for these materials will be provided by Precision Group Pty Ltd.
BSB10115 Certificate I in Business Learning Resources Package Includes 6 Units of Competency! As part of this Certificate I in Business Learning and Assessment Resource package, you will receive assessment materails for a full 6 units of competency. You can choose from the available electives to design a package to assess specific skills and knowledge useful in a wide range of Business settings. The assessment has been edited by an Independent Quality Consultant so we are confident that they will meet audit requirements. Precision Group Pty Ltd will contact the auditor, and if changes are able to be agreed, you will be sent replacement copies of the assessment tool at no cost. This compliance guarantee is provided by the resource developer, Precision Group Pty Ltd.